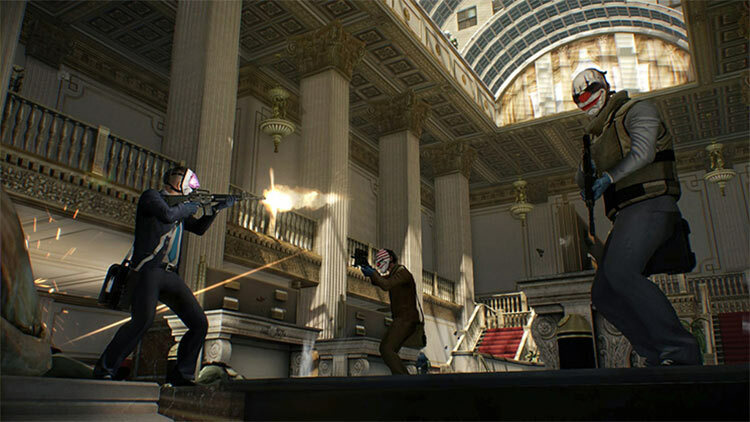 Although Payday 2 is an early first-person shooter to hit the Nintendo Switch, it provides an average experience that’s worth skipping. The level of character customization is great and brings a sense of ownership to the adventure, but enemies are incredibly hard to see at times, often leaving the player squinting after every shot fired. Ultimately it doesn't matter which way you decide to play; you're having to compromise somehow, which is the story of Payday 2 on the Switch. 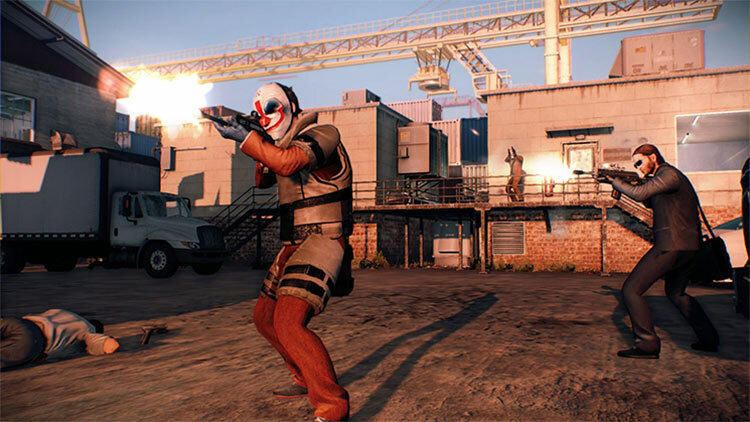 It is an entirely functional video game that (in most respects) looks, feels and plays like Payday 2, and given the right circumstances, can also be a bit of fun. But given how readily available it is on other platforms and the concessions made with this version, it doesn't highlight Payday 2's unique brand of shooting and looting the way other platforms have for years. It’s nice that Switch owners can cash in on Payday 2’s co-op action, which remains great, and the new playable character has a skill set that introduces a new support style. 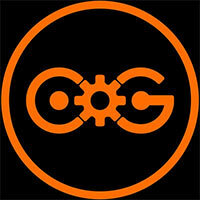 But this version is handicapped by its lack of voice communication tools. Even if it’s updated to parity with the PC version, that’s a tough pill to swallow in such a cooperative game. Playing Payday 2 in portable mode is a bit of a hassle, especially when playing missions that take place in darker environments. 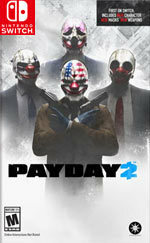 If you already enjoy Payday 2 on another console, save your hard earned (or stolen) dollars and buy another game. If you’re new to Payday 2, just make sure you have some friends to play online with, because playing solo is just awful. 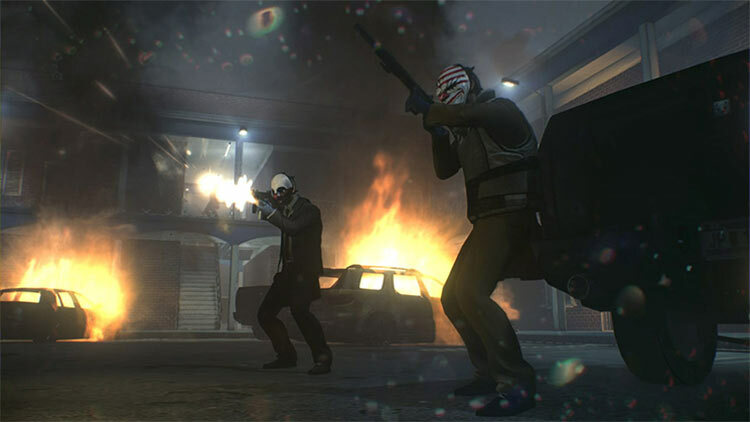 Payday 2 has a lot of good ideas, but is held back by a bevy of issues. For those who have a dedicated group to play with online there are hours worth of fun to be had overcoming the more difficult challenges. However, If you’ll need to rely on random players the fun can only go so far without any form of communication. And if playing solo is your only option, I’d highly suggest thinking twice because quite frankly playing alone is not very much fun at all. The longer and more complex missions are quite well designed, if you can find a crew to play them with. Good character upgrade system with some fun perks. Cheap, ugly visuals and very poor optimisation for the Switch. The variety in missions is not matched by the objectives themselves. Poor AI and mediocre gunplay. Too expensive. There are some nice ideas here, but especially in handheld mode, Payday 2 can be very frustrating. Payday 2 has finally arrived on the Nintendo Switch, but it turns out to be more of a mixed bag, than flat-out perfection. 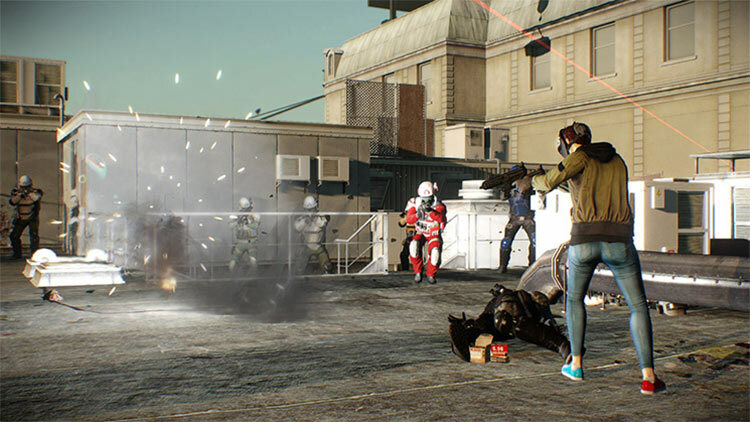 The Switch version of PAYDAY 2 also includes a 4 player local co-op mode, which allows for 4 Switch units to link up in the same room for some local action. Every mission in the game can be played in single player as well, but your teammates A.I. is pretty low. They will shoot some people, they will help you if you get downed, but they won’t help you with mission objectives which can make things a bit too difficult at times. Sin olvidarnos de que además, Nintendo Switch aún no tiene chat de voz, y que los Joy-Con no acaban de ser el método de control óptimo para los juegos de acción en primera persona. En resumidas cuentas, un shooter entretenido, sobre todo en modo cooperativo local, pero demasiado de la vieja escuela. PayDay 2 sigue siendo un juego muy divertido y recomendable para jugar con amigos, ya sea en Switch, PC, PS4 o Xbox One, pero eso no quita que esta nueva versión para la consola de Nintendo nos haya dejado ligeramente decepcionados por la gestión que se ha hecho de sus contenidos. Sí, tiene la ventaja de poderse jugar en portátil, pero a cambio nos llega con menos contenidos que el resto de plataformas, obligándonos a esperar un tiempo indeterminado para poder estar a la par que el resto de usuarios. 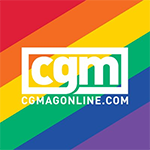 Las misiones, algunas más variadas que otras, nos han ofrecido momentos en el que nos hemos sentido como auténticos atracadores (sobre todo cuando hemos podido completar alguna fase en sigilo), pero lo cierto es que la jugabilidad basada en masacrar hordas de enemigos no demasiado inteligentes ya no se siente tan fresca como en la pasada generación. Des contrôles trop aléatoires à un rendu sur grand écran qui donne la nausée en passant par une IA désastreuse, la version Switch de PAYDAY 2 croule malheureusement sous les problèmes techniques malgré un contenu généreux et des performances plutôt solides en règle générale. L'arrivée de PayDay 2 sur Switch avait de quoi réjouir les possesseurs de la console de Nintendo ainsi que les fans de la licence. 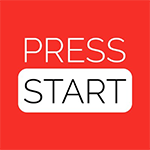 Mais si cette version Switch bénéficie des mêmes points forts que celles sorties sur les autres supports, et qu'elle est tout à fait jouable, elle est également dénuée d'options dont la présence semblait pourtant tomber sous le sens. Payday 2 souffre sur bien trop d’aspects des concessions apportées à ce portage Switch. Graphiquement faiblard, peu maniable et surtout privé de toute possibilité de communication avec ses coéquipiers, les nouveaux comme les anciens joueurs n’y trouveront qu’une version bancale d’un titre pourtant bourré de contenu. 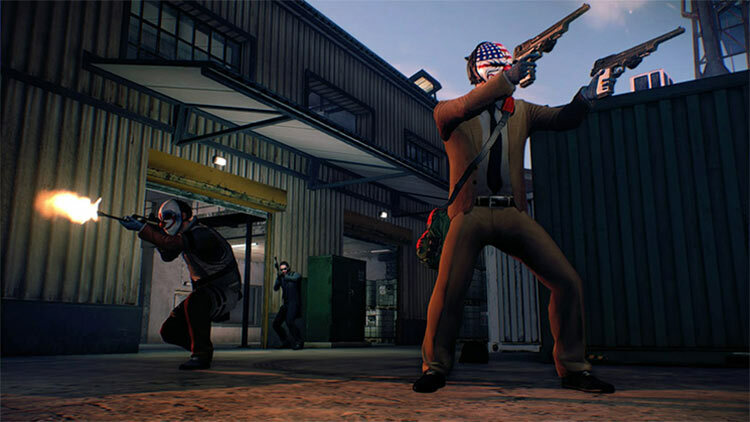 Em suma, PAYDAY 2 está na Switch como uma conversão que não envergonha ninguém mas a não ser que se esteja na companhia de mais três amigos que também adorem o jogo, tenham uma Switch e não se preocupem em ter que estar a criar uma sala de chat numa outra aplicação, não se encontra nada neste jogo que divirta, apenas frustração. Rimane infatti ancora oggi un signor sparatutto cooperativo e questa nuova versione per Switch, seppur non perfetta, è comunque consigliata a chi non conosce ancora il gioco. 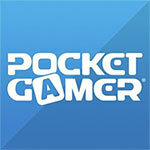 Certo, non ci sono ancora tutti i colpi disponibili su PC, i 30 fps non sono proprio marmorei e manca ancora il supporto per la chat vocale (ma qui pare sia colpa di Nintendo), ma sono tutti difetti potenzialmente risolvibili con un aggiornamento che speriamo arrivi il più presto possibile. Payday 2 su Nintendo Switch è lo stesso, solidissimo sparatutto in soggettiva cooperativo visto - e giocato - alcuni anni fa. Peccato solo che gli sviluppatori abbiano optato per una conversione a tratti zoppiccante, specie dal versante puramente tecnico. Oltre al fatto che la mancanza della chat vocale, totalmente assente nel momento in cui scriviamo, è un limite non da poco per un titolo di questo genere.